This is the only book of its kind in abrasives technology pulling together information scattered in hundreds of technical papers and conference proceedings with new sections written by authors who are renowned experts in various aspects of abrasive technology. This 650-page illustrated book provides a detailed coverage of tribology principles for the most common abrasive processes. Includes discussions of kinematics with an emphasis upon grain distributions and abrasive materials from conventional aluminum oxide to new ceramic and superabrasive minerals. Sections on heat transfer will help engineers understand thermal stresses in grinding. A discussion of molecular dynamics simulation shows how tribology can provide a way to develop new abrasive processes and understand complex technologies such as CMP (chemical mechanical polishing). Another section compiles knowledge on the effects of fluids and the tribology of lubricants in grinding and other abrasive processes. 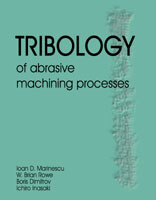 With the spotlight of machining in industry focused on processing down to nanometer dimensions, demand for new abrasive methods is growing and the study of tribology as applied to grinding is essential to developing new manufacturing methods and to find better ways of increasing precision says the authors. Tribology offers a means to improve predictablity of existing processes as well as maintain better control of production rates and surface quality of products for all industries. For samples of text,further information, or to order this publication contact the Abrasives Mall. Credit card accepted. Ioan D. Marinescu is Professor and Director of the Precision Micro-Machining Center at The University of Toledo, Toledo, Ohio. Previously, he held similar positions at Kansas State University and the University of Connecticut. He is a coauthor of the Handbook of Ceramic Grinding and Polishing and has given numerous presentations on various aspects of abrasive processes in Europe and the United States. W. Brian Rowe is a research and consulting engineer, previously Professor and Director of Advanced Manufacturing Technology and Tribology Research Laboratory (AMTTREL) at Liverpool John Moores University in the UK. A multiple recipient of prizes from The Institution of Mechanical Engineers (IMECHE), Dr. Rowe has four decades of experience in academic and industrial positions concerned with machine tools, grinding processes, and tribology. His accomplishments include over 250 published papers, several books, international visiting professorships, and international consulting in industry. Boris Dimitrov is a consultant and a former senior scientist at both the Institute for Applied Mechanics and the Institute for Precision Mechanics in Bucharest Romania. In his four-decade career in tribology and machining research, in both academic and industry capacities, he has produced 128 publications including three books. He holds five patents.